I’ve never really understood the concept of The Lover’s Leap… but then again, I didn’t grow up in a time when class distinctions and race lines often made true love difficult. Still, I can’t imagine choosing to throw myself over a ledge with my lover to… what? Be dead together forever? Maybe if I believed in God and an afterlife this might be a little more appealing, but I really doubt it. 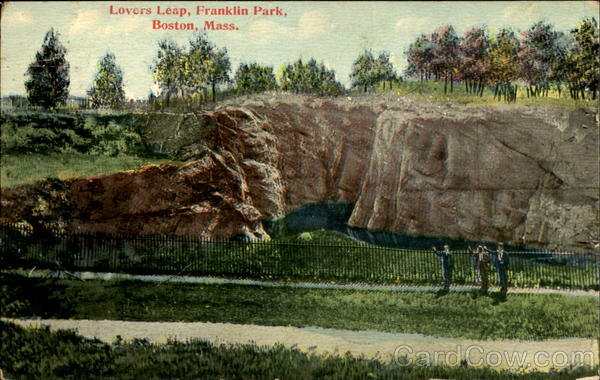 All of this is to say that one of the more interesting pictures I have uncovered of Franklin Park is of The Lover’s Leap. This postcard shows a rocky ledge with water below, a long fence separating spectators on a path from the rocky heights. What makes the Lover’s Leap so interesting to me isn’t its height or the promise of stories of forlorn and suicidal couples who choose death over ignominy… nope, what I find most fascinating is how hard that damned thing is to find. Yes, it seems as if a giant, 94 foot cliff face should be easy enough to find in a park that is only 1 square mile, but…. well, it isn’t. The caption goes on to describe several other rock formations in the park, but this is the important part that sent me wandering for many days. First and most problematic: where the hell are Rock Morton and Rock Milton? On the surface this should be pretty easy. 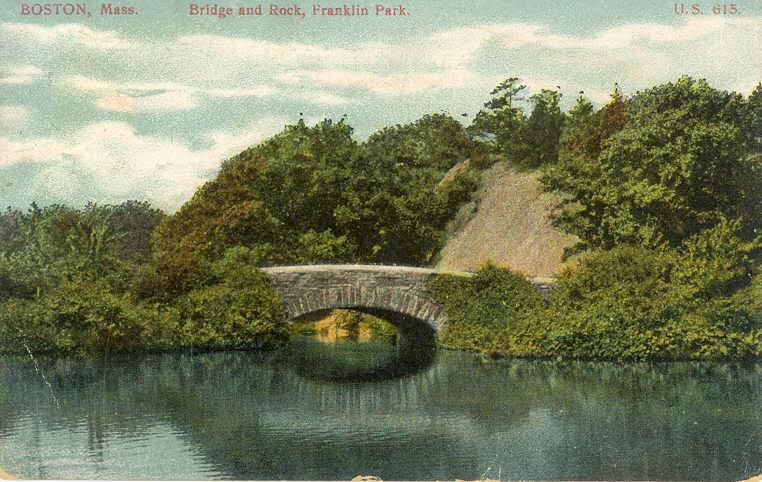 Crossing the Carriage Bridge in Franklin Park, on the Morton Street side of Scarboro Pond, one can easily see the giant Rock Milton overlooking the small pond and separating the bridge from Heathfield and the Shattuck Hospital. But is this really the rock that Olmsted called Rock Milton? Huh? 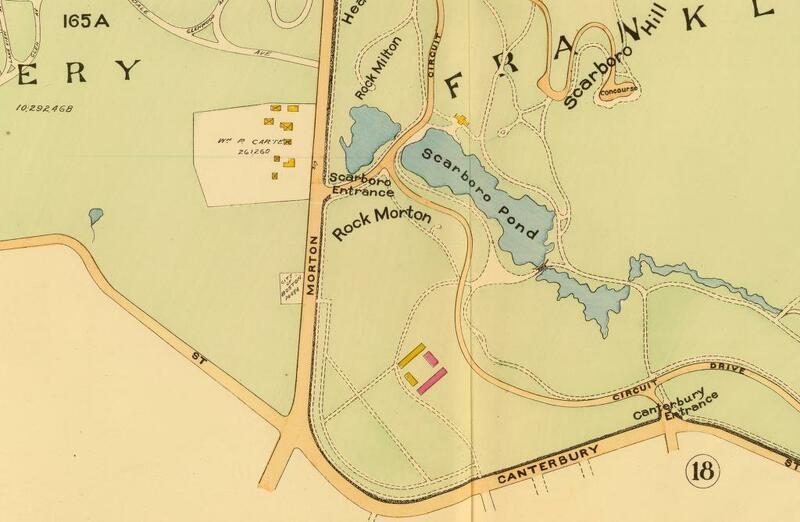 According to the map, the pond is north of Rock Morton and south of Rock Milton. Either they built the pond in the wrong place or Olmsted called the rocks by different names. So I sent an email to Mark Bulger asking for clarification and headed out into the park. Since I was looking for The Lover’s Leap I brought a copy of Arrison’s book and made a deliberate effort to find the angle of the original photograph. The obvious choice was the northern rock, labeled on the map as Rock Milton (and in fact on all maps I can find) that Olmsted called Rock Morton. It is high and sheer, with water at the bottom, seemingly a perfect match to the image of the Lover’s Leap. Yet, no matter what angle I approached Rock Milton I could not find a view that matched the image. From the carriage bridge the rock face is at too steep an angle. From across the pond it is not even close, and from Morton Street it is obscured and not close to the picture. On top of that, the cracks and undulations of the rock don’t fit. Now, I’m not a geologist but I can observe the world, and unless the rock face was drastically reshaped by dynamite, Rock Milton is not the same rock in the Lover’s Leap photo. So I devoted two days to climbing all over the area on the map labeled Rock Morton. Here the wooded, sloping face immediately let me know I was not on the Lover’s Leap. 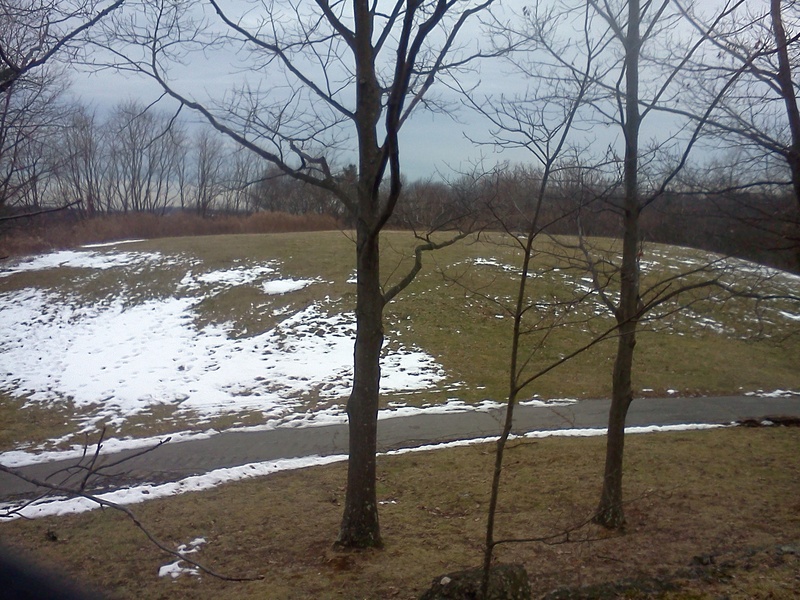 There is, other than a small bare rocky knoll, nothing on Rock Morton that even deserves the title “rock.” It is a little hill, similar to many in Franklin Park. Great questions! First, I suspect that any confusion between Rocks Morton and Milton can be filed under ‘just one of those things.’ A plan is submitted with one name on it, and then another name sticks for some reason. I’ve seen that happen quite a few times in my researches, so I know not to demand a too rigid consistency. Second, I think I may have an answer for the Lover’s Leap, although I’m not absolutely sure. I thought I had posted on this matter, but I couldn’t find it in a search. I believe that it was early in the 20th century when a boy drowned in a flooded quarry in the park, causing it to be filled. The attached map from my blog shows the ‘old quarry pond’ near Schoolmaster Hill. Based on the postcard you linked to – which I’ve been wanting to do something with for a year now – I suspect that may be the site of the Lovers’ Leap. Note the two walking paths in the foreground of the postcard, which match pretty well with the map I attached. 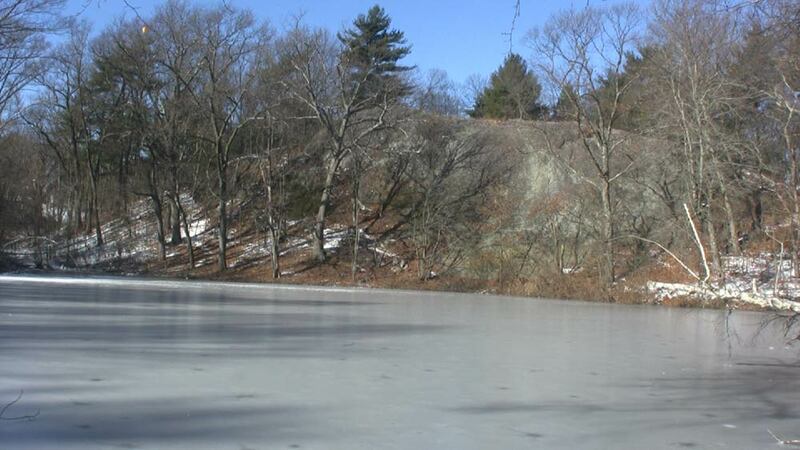 The postcard certainly looks nothing like the Rocks near Scarboro Pond, as you’ve seen. With the exception of that postcard, I’ve never seen a reference to a Lover’s Leap in Franklin Park, so I have nothing else to go on than the speculation above. I hope this helps. Looking at his attached map, there is certainly a compelling case for the quarry as the Lover’s Leap. It has about the right shape, but why is it not near Rock Morton/Milton as Arrison claims? Is she just wrong? From the Boston Public Library Flickr stream. Click to view on Flickr. Around the time I was looking into the Lover’s Leap, I found this photo on the Boston Public Library’s Flickr stream showing a rock face with the caption “Boston. Franklin Park ledge, 94 feet deep.” A basic comparison shows that this rock ledge and the Lover’s Leap are the same thing – the cracks in the rock and the general shape match up very well. The caption “94 feet deep” added something new to the mystery, but here I had a picture of a rock face that matched the Lover’s Leap and, based on the wooden platform on the left and the lack of water at the base, also seemed to confirm Mark’s claim that the Lover’s Leap was the old quarry near Schoolmaster Hill. 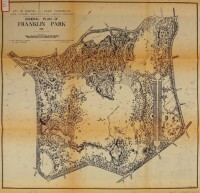 Topographical map of the Franklin Park area from 1884. The quarry area and Schoolmaster Hill are in the center of the map, just below the intersection of Walnut and Williams Streets. 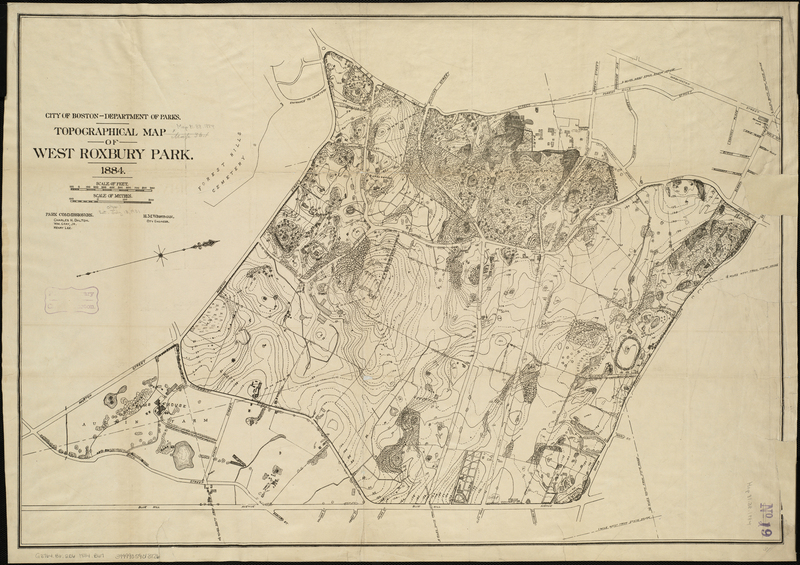 For me, the final clue that convinced me that the old quarry was the Lover’s Leap came in the form of the 1884 topographical map of the area, created before the General Plan of the park and used by Olmsted to lay out the grounds. In this topographical map, the height of the rocky ledge to the west of Schoolmaster Hill is listed as 58′ elevation at the base and 152′ elevation at the top – making the steep drop between top and bottom 94′! Having found what I was pretty sure was the Lover’s Leap, I headed over there on a rainy day to see if I could find any views that looked like the postcard. My first trip on November 27 took me up onto the top of the hill, which is a bare grassy knoll topped with a small puddingstone rock. The front of the old quarry falls away as a steep and scrubby slope, which looks from the top like a messy and impenetrable tangle. Poking around some of the paths in the woods I found clear evidence to confirm Mark’s email: “I believe that it was early in the 20th century when a boy drowned in a flooded quarry in the park, causing it to be filled.” I can’t confirm the drowning, but it is obvious from all angles that there is a wide area that has been filled with landfill. I paced the top edge of the knoll in 50 steps, which makes the width of the landfill area approximately half the length of a football field. Two days later I went back, this time trying to find a new perspective. Instead of going to the top, I decided to see what the view looks like from Scarboro Hill, which faces the old quarry and Schoolmaster Hill across the valley of the golf course. Right away I saw where the quarry had been, and that it was probably the Lover’s Leap. I’m never going to be 100% certain, but it fits the profile of the hillside, especially knowing that the whole thing has been filled in and the contours of the golf course added later. 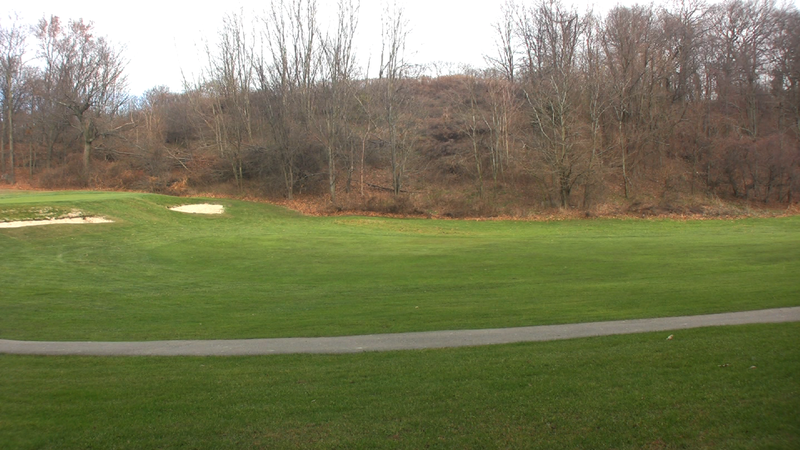 Crossing the golf course in the rain, I pushed my way through the overgrowth onto the hillside at the edge of the old quarry. 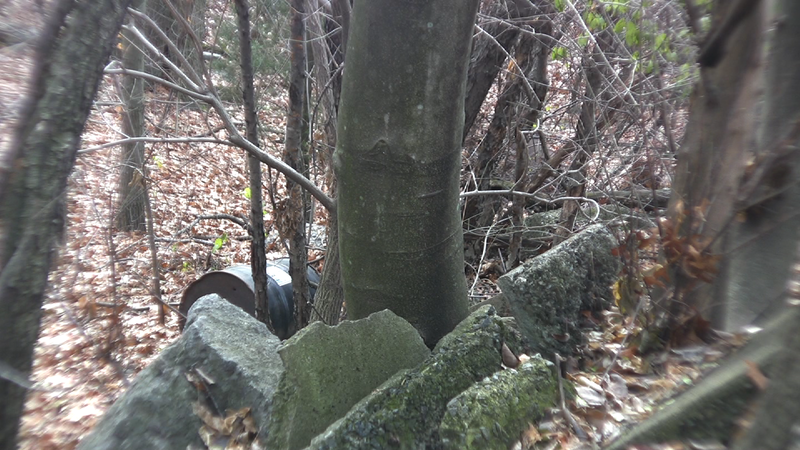 The edge of the landfill area is very clear once you get into the woods, and I thought about climbing it except that the glacis is covered with rusting chunks of metal, old barrels, and and uneven mess of stones and undergrowth. Instead, I climbed the puddingstone and roots along the edge of the landfill, admired a hawk feeding on a dead squirrel, and emerged from the woods at the top to startle a young couple out for a walk. Of all my explorations in Franklin Park, the search for the Lover’s Leap has been the most fun because it feels almost like detective work. 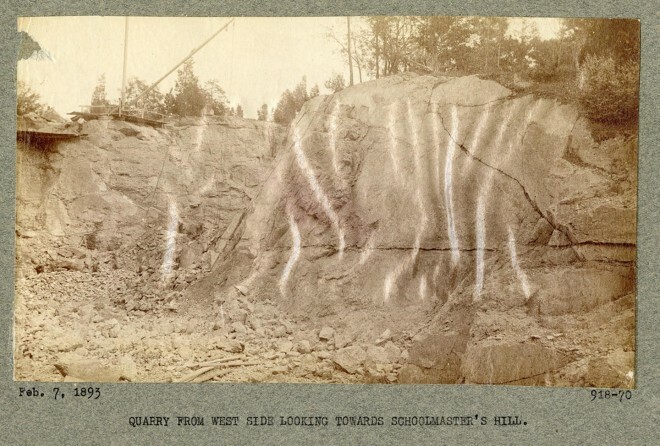 I’m fairly certain I’ve found the site of the rock face depicted in the postcard, and I’m still looking for documents to verify that I’m right. 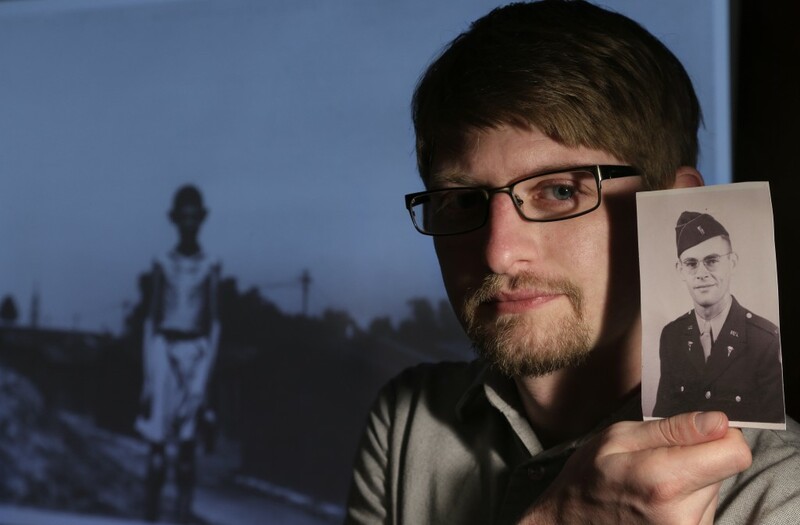 But the height shown on the topographical map matches the height on the image from another historical image that matches the postcard… so it all seems to work. As with all sites in the Park, I’ll be returning with my camera monthly to document how these places change with the seasons. I’m endlessly fascinated with this psychological space that Olmsted created, in which I am forever aware that the Park he created is gone and the original structures in ruins, yet I feel the same separation from the city and distance from the pressures of life that he intended for his visitors. Finding the Lover’s Leap as a buried, overgrown tangle studded with toxic debris does not change it for me or make it any less amazing. I can look past the mess and the golf course and the rusting waste and see what once was… and even if I’m the only one who cares, I’m fine with that. A view of what I think is the Lover’s Leap. Note the ruins on Schoolmaster Hill on the right. Below is a screenshot from Google Earth. In this satellite view you can see the old quarry and Schoolmaster Hill. 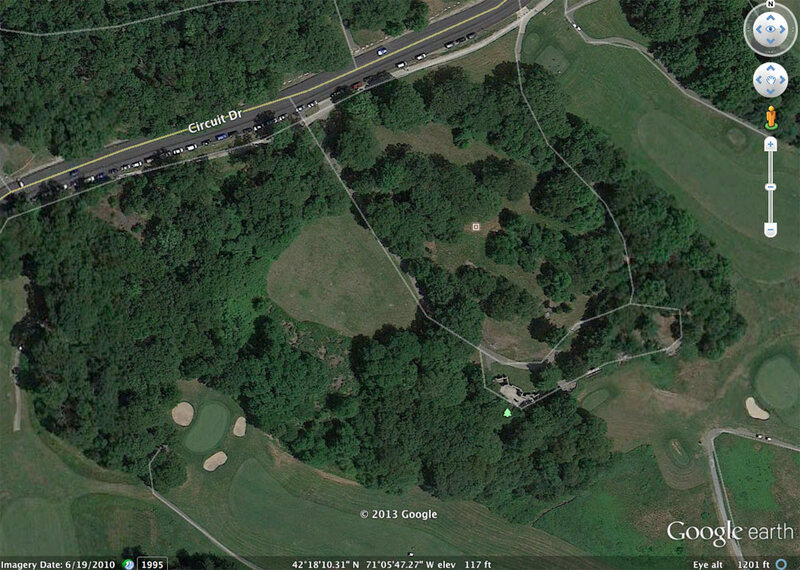 At the top of the image is the Circuit Drive and the open grassy circle to the left is the filled in quarry. Below that you can see the tree-covered glacis of the filled in quarry that I think was the Lover’s Leap. 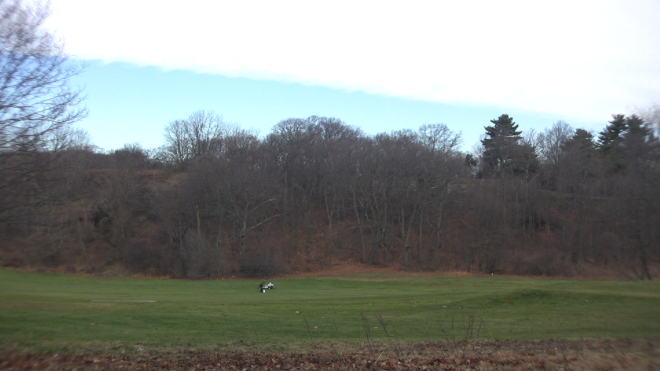 To the right are the hilltop and building ruins on Schoolmaster Hill. Image from Google earth of the Schoolmaster Hill area in Franklin Park. 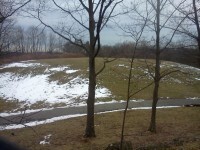 The large circular open area in the left/center is the top of the old quarry. Below that is the filled-in glacis that might have been the Lover’s Leap. 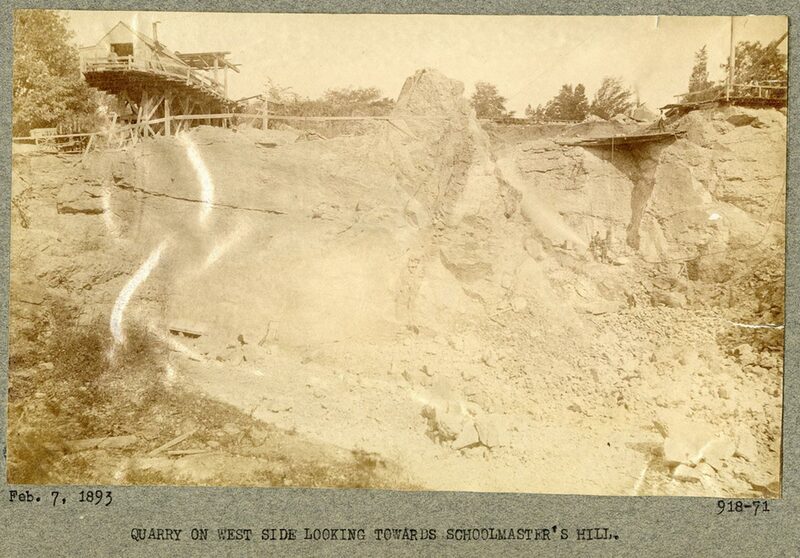 Recently I was looking at the Flickr stream of The Olmsted Archives and found two new views of the quarry! This is definitely the same spot shown in the Boston Public Library image above, but combined they show a panoramic view of the quarry and confirm that it is indeed the Lover’s Leap. 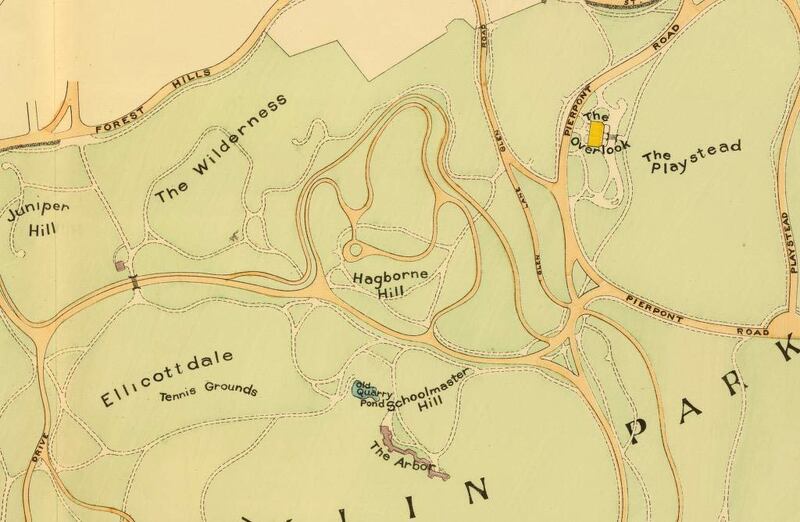 So I think that I’ve definitively proven that the quarry in the Park, shown on the maps as the western side of Schoolmaster Hill, is also the Lover’s Leap in the postcard. (slaps hands together) My work here is done.